Set at the turn of the century in Cape Breton, this is the story of the first day of work for young James, a miner-to-be. In the early morning sunlight, James and his father reach the entrance to the mine. They are brought via a steel elevator down below, underneath the ocean, to the heart of the mine. James works next to his father, digging and blasting the walls, shoveling the rich black coal into the carts. But there is more for James to learn as the mine is a dangerous place, constantly putting each miner's alertness to the test. Ian's acrylic painted canvases retain their grainy texture giving the impression that the coal dust has permeated every surface. The dark, dense blackness of the coal mine realistically portrays the enclosed space, the sense of depth below the surface, the weight of the earth above. With this poignant story, Ian honours the memory and legacy of his own grandfather who was a coal-miner. Buy Online: Canada / U.S.
You can feel the chill in the air in Ian's story of a father and his children, Eugene and Abigail, who venture out on a winter camping trip. The trip, a gift for Abigail's ninth birthday, is her first overnight winter excursion. The landscape is portrayed in stark, chilly colours of white, grey and brown, until the end of the day when we are treated to a brilliant red and orange sunset. 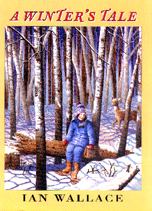 An encounter with a trapped deer comes to a happy conclusion as Abigail helps to free the frightened animal. Ian shows the animal escaping to freedom in a striking double-page illustration, silhouetting the leaping deer against a grey sky and a full moon. In this haunting tale, author W.D. Valgardson takes us on a journey back to the time of his ancestors and the rugged world of the Frog Bay settlement in southern Manitoba. When she was a young girl, his great-grandmother Sarah, who speaks only Icelandic, is sent from her home in the wilderness to the city to learn English. There she is mistreated by her caregiver. But mysterious strangers turn up and give Sarah gifts to help her through the cold winter. The mysterious strangers help her again when she decides to escape the city and return to her beloved home. Ian's illustrations provide a perfect complement to this rich story. At times they show the small details of Sarah's world. At other times, they extend the story in striking ways. Ian has captured the magic and mystery of the story with his pale, dreamy illustrations. The book is full of shadows and light that echo the darkness and light of Sarah's life. 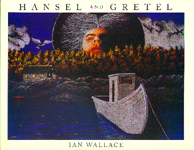 Ian sets his retelling of Hansel and Gretel in the woods of eastern Canada. The children are abandoned in the forest by their fisherman father and his wife. A dark and foreboding mood is created by Ian's pastel pencil illustrations done on black paper. The witch is watching them, subtly hidden in the landscape. Hansel and Gretel follow the beguiling song of a bird and discover a fine cottage made of sweets. It is the witch's house! As in the original story, the quick-thinking Gretel saves her brother before he turns into the witch's next meal. The children discover jewels in the cottage, fill their pockets and head home where they find their father, a remorseful widower.